Many of the garden tips and tricks floating around out there have been passed down through generations, spread by word of mouth or found on the Internet. Many gardeners tend to rely on these methods and some of them are accurate and incredibly helpful, however there are a few, very common tricks that are actually big misconceptions. These misconceptions act as more of a hindrance than a helpful garden hack. Let’s expose these common garden myths and make your gardening experience a whole lot easier for next season. Most people believe that adding a layer of gravel or stone at the bottom of a container will help improve drainage. I have actually heard this tip a number of times and I have tried it but with no avail. The gravel you place at the bottom of your planter will actually prevent free drainage and lead to moisture collecting around the roots. To avoid the inevitable root rot and disease, use a container with a drainage hole as well as a good potting mix. It has been said that planting “smelly” plants around the outside of your garden will keep deer and other pests away. I have been struggling with keeping deer out of my garden for some time now, and I can tell you first hand that smelly plants do not do the trick. The deer are smart and they quickly learn to simply walk around the smelly plants to get to feast on your garden. Click here for some alternative methods to keep the deer from invading your outdoor space. There seems to be a lot of misconceptions regarding the fertilization of plants as well as lawns. Some people believe that since a little fertilizer is good for the plants, then adding more will work better. This is incredibly wrong. Adding too much fertilizer to your plants will fry the roots as well as stunt the plants natural growth habit. Most fertilizers have a high content of nitrogen; too much will result in a lot of thick foliage but no blossoms or fruit. The excess fertilizer can also wash into the ground water, which has been causing problems for local bodies of water throughout the state. Too much fertilizer on your lawn will result in burning; your green grass will look like straw. Many gardeners want to have a drought-tolerant garden. This is mainly due to the misconception that these drought-tolerant plants require no water. Drought-tolerant does not mean: “no water required” it simply means that the plant requires less watering than others. No matter what, all plants need regular water until the plant is well established. Certain plants do become drought-tolerant after they are established, but they still require occasional watering. Especially in the heat of summer, make sure you are watering your drought-tolerant plants moderately. When it comes to watering lawns, there are many opinions on the best time to complete this task. Most people tend to believe that watering at night will help save water and keep the grass healthy. However, if you are watering your lawn at night, the water will sit on the lawn throughout the evening and thus inviting mildew and fungal diseases. In truth, it is best to water your lawn in the morning, giving it more than enough time to dry before nightfall. Gardeners everywhere love using mulch in the garden, however most people believe that the mulch should be piled up against the shrubs to keep them healthy and protected from possible winter damage. This is also false, Mulch helps retain moisture and keeping the plant material constantly damp can lead to a number of diseases and fungus. 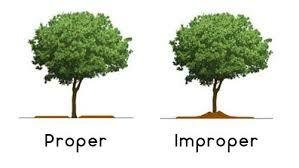 When mulching in your garden, be sure to keep it a few inches from the trunk of your plant material. There is another misconception that sand will improve the quality of clay soil. Adding sand to clay soil will result in your soil having consistency comparable to mortar. The best way to improve clay soil is by introducing organic material, compost or finely chopped bark will do the trick. English ivy can be invasive but is not a parasitic plant, as some believe. It can grow up to 90 feet and kills other plants by blocking out the sunlight necessary for success. Most people tend to believe that sterilizing their garden tools with a bleach and water mixture works the best. Bleach is actually corrosive and will gradually ruin the quality of your tools. Some alternatives are rubbing alcohol, Listerine, Lysol or WD40 – these products are relatively safe to use in small quantities. Always make sure that you sharpen and clean your garden tools regularly - this will help to avoid spreading any fungus or disease to your other plant materials. Another tip most gardeners tend to follow is that young newly planted trees should always be staked. The truth is allowing the young tree to move freely allows it to grow stronger and sturdier. If you are planting your new tree in a fairly windy spot or if the tree tends to be top-heavy, it can be loosely staked with a flexible and soft material. Make sure that the stake isn’t in place for longer than six months. 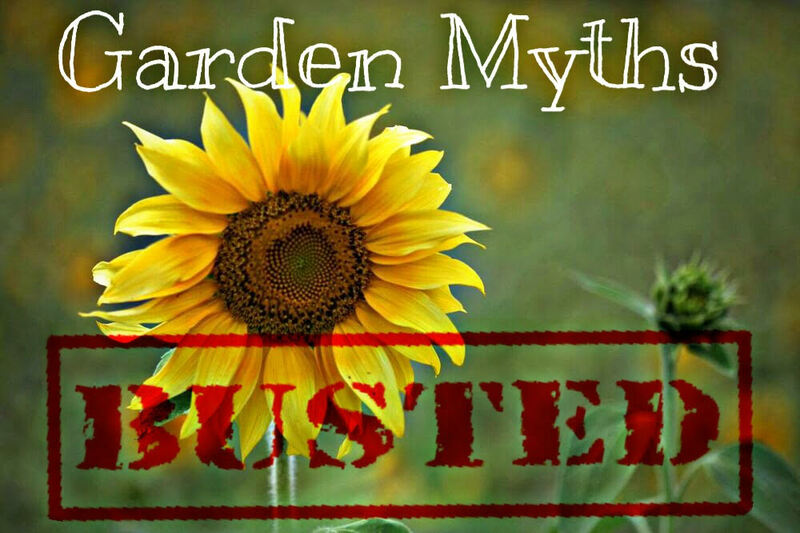 Use the tips we have listed in this article to help avoid these common garden myths. If you are unsure of a garden hack that a friend or relative mentioned to you, a little research won’t hurt. As landscape designers, we love our gardens as much as you do! We want to make sure that your gardening experience is as relaxing, enjoyable, successful and most importantly, SAFE. We all can’t wait for the next gardening season, but keep these tips in mind and if you have any proven garden hacks or other myths to be debunked, please post them in the comment section on our Facebook. For avid gardeners, it feels as though as soon as the growing season arrives, it’s gone. For the blooms this might be true, but for your landscape as a whole, there is still plenty of time to care for it before it enters its dormant period. Preparing your lawn and garden for the cold weather is incredibly important when it comes to keeping a happy and healthy landscape. There are important tasks to complete in the fall to make sure that all plant materials are ready for that strikingly cold first frost. Take a look at the steps below to help you prepare your garden for dormancy; at the bottom of this post we have our downloadable and printable fall checklist to make your garden prep a breeze. First you want to assess your garden. Your garden can tell you a great deal upon conclusion of the growing season. To prepare for the next growing season, first you want to assess the results of your work from this season. Assess the overall health of your plant materials, check for diseases and damage and address accordingly. Next we begin the physical preparation – its time to clean up the garden! You should weed, deadhead faded blooms and replace any ties with jute twine The natural fibers work better over the winter because they are more flexible – they will break down over time but by the time that happens you will be needing to retie your plants anyway. Next you can begin cleaning up your plant material. You can lightly prune dead and broken branches from your trees and shrubs but take care when pruning your flowering plants. Some plants flower on old growth (certain types of hydrangeas for example) so when you prune off the old growth, you’re actually pruning off next years buds. Spent flower heads can be pruned off but if you’re unsure of the pruning methods of a certain plant, it doesn’t hurt to look it up. Then you want to see if any of your plants have outgrown their space in your garden. If so, then they might need to be divided. If you have perennials in containers, you can remove them and trim the roots before planting them in the ground (root pruning will hem stimulate new feeder roots). Make sure to remove any annuals or bulbs from your garden that aren’t zone hardy – be sure not to forget your containers and window boxes as well. You can save seeds from your annuals for next year. You can use cool weather annuals in your containers such as kale, pansies or garden mums. You can then add soil to the areas where plants were removed or areas where additional soil is needed. 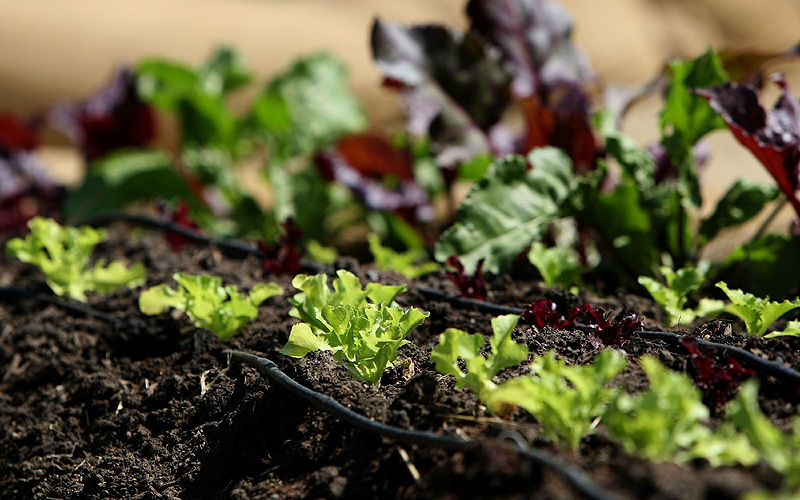 You can add compost and peat moss to replace any lost nutrients from the growing season. Add mulch to needed areas in your garden but make sure it isn’t sitting on low lying branches or pushed up the stalk of a plant. 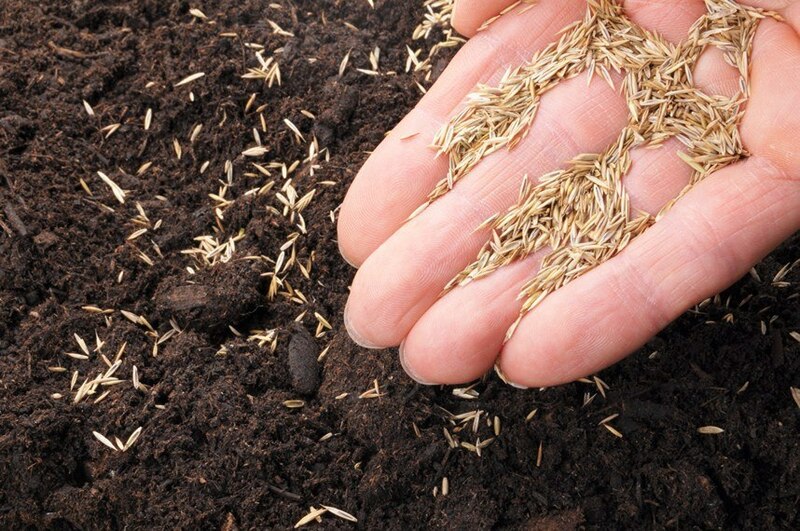 The fall is the perfect time to lay down seed to fill in those bare patches throughout the lawn - the cooler weather will allow them to have a better chance at germinating and developing a strong root system before the freezing temperatures arrive. Aeration will help to break up compact soils and aid in seed germination – the two can go hand in hand. You should also apply your winter fertilizer –a slow release all-natural fertilizer will do the trick. Your lawn can store food in the form of carbohydrates during the winter season, allowing for a healthier and stronger lawn the following season. If weeds were a concern this season (as they usually are) you can also apply a selective pre-emergent herbicide (like you did in the spring) – this will help deal with weeds that have been deposited during the summer. You can also use a spot treatment of post-emergent herbicide however most people would rather put down grass seed instead. If grass seed as been laid on your lawn do not use any weed control as this will stop the grass seed germination along with the weeds. Make sure you know the difference between selective and non-selective herbicides – a non-selective herbicide will kill everything including your lawn. 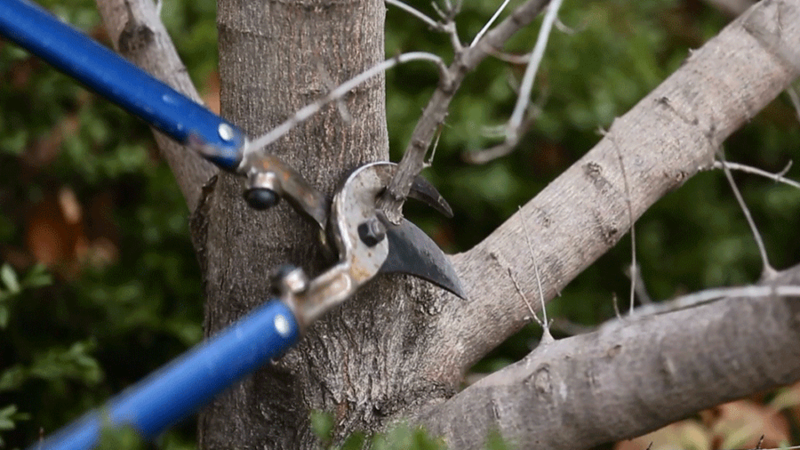 Lastly, early fall is a great time to plant trees and shrubs. For some plant material suggestions and tips, take a look at our Fall Is For Planting post. Plus, nurseries and garden centers have everything on sale to help clear their shelves for the season. Following this checklist will help you ease your garden into dormancy and allow for happier, healthier plant materials next season, as well as a cleaner garden! As the days grow shorter and the weather grows colder, gardeners everywhere dream of the upcoming growing season – so take advantage of the time you have left this year to make the most of the 2017 growing season. Come springtime, your garden will be thanking you for your love and care during the previous season. So take this list, check it twice and count the days till spring arrives. Happy gardening! When Should You Plant Trees & Shrubs? It's True Folks, Fall Is For Planting! In the world of gardening, there is a huge misconception that the leaves changing color and the temperature dropping signals the end of the growing season. This is false; the growing season doesn’t end until the plants enter their dormant period. What most people don’t know, is that it is actually more beneficial for your trees and shrubs to be planted in the fall as opposed to the spring. Planting your trees and shrubs in the fall gives encourages them to establish a stronger root system before the heat of the next summer. Fall technically begins late in September – the best time to plant your trees and shrubs is about six weeks before the first sign of a hard frost. September through November is the perfect time for planting because even though the air is getting cold, the ground is still warm. This allows the root systems to become more established before the dormant period resulting in a stronger and healthier plant for next season. With the cooler temperatures and the increase in precipitation, less watering is required and there is no need to worry about damage from the summer heat. The stable air conditions also allow for rapid root development; rather than focusing all its energy on foliage or flower production, the tree puts its energy into establishing a stronger root system and in storing nutrients for dormancy. These fall plantings will become better equipped to handle summer heat and drought due to their strongly established root system. From a designer perspective, being able to see a plants fall interest before putting it into the landscape is always a plus. There are some species you should avoid planting in the fall however, broad-leaved evergreens such as rhododendrons, azaleas, boxwoods and hollies require extra care through the winter months. They will need protection from winter winds and should be treated with an anti desiccant. We also recommend that you stick to zone hardy plant material – Schip laurels for example, don’t tolerate winter winds very well at all, the key is to plant them where they can be guarded (for example, as a foundation planting where the house combats the wind). When planting in the fall, there are three things you should keep in mind. 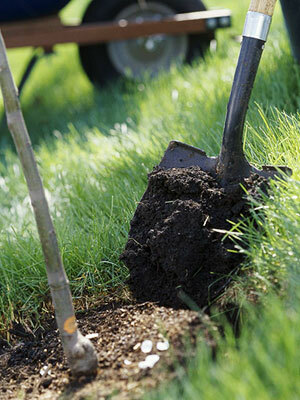 Make sure to plant high, the soil will settle leaving your tree or shrub susceptible to root rot or disease. Don’t amend the soil around your new planting – you want to allow the roots of your new tree or shrub to grow into the native soil. With the amended soil, the roots are more likely to experience reduced growth resulting in a smaller root system and a weaker plant. We suggest you break up any clumps in the soil and remove any rocks to allow the root system to travel as it pleases. Make sure to add mulch to your new planting. You can use around 3 inches of mulch or organic matter around your plant. The organic matter should be shredded leaves or ground bark/nuggets. Adding this layer will help protect the root system during the cold weather and allow for better water retention. If you’re looking to plant a tree this fall, here are some species we recommend: maple, spruce, pine, crabapple, linden, elm, hackberry, hawthorn and honey locust. Planting these trees and shrubs this fall will prove for healthier, happier and hardier plants for the next growing season. Studies show that trees and shrubs planted in the fall, when compared to those planted in the spring, have a more established root system and stronger overall health. A strong root system leads to a strong plant! You should also keep in mind that garden centers and nurseries are trying to clear their stock for the season – who doesn’t love a good discount? Chelone lyonii also known as Lyon’s turtlehead or pink turtlehead is a great way to add wonderful color and a unique twist to your garden late in the season. The turtlehead’s name stems from a story in Greek mythology where a nymph (named Chelone) refused to attend the wedding of Zeus and Hera, the gods punished her by turning her into a turtle. However, I’m sure she would be honored to have such an interestingly beautiful flower named after her! The turtlehead adds seasonal interest to your garden with not only its unique blossoms but its thick foliage as well. As the flowers of summer start to fade, this beauty is just getting started. The turtlehead features rose-pink flowers set on terminal spikes piping out of thick, deep green lustrous foliage. The name “turtlehead” refers to the flowers that slightly resemble a turtle’s head, similar to the hooded flower of the snapdragon. They have pink corollas that have lower lips covered in a slightly yellow beard. The foliage is ovate and coarsely-toothed – the leaves are about 3 to 6 inches long with slender petioles, rounded bases and pointed tips. It can grow to be 2 to 4 feet tall and is easily groomed to have a bushy habit simply by practicing regular pinching. It can also be kept slightly shorter if you pinch back the stem ends in the spring. Being deer resistant, a pollinator favorite as well as being adored by butterflies, makes the turtlehead a late season perennial favorite. When designing your shade garden, accompany Chelone with Heuchera Americana, Polystichum acrostichoides, Solidago rugosa ‘Fireworks’, Lobelia siphilitica and Conoclinium coelestinum for a true late season combo. Chelone thrives in moist soil and light shade, however it can become slightly drought tolerant once it’s established. They prefer humusy soils along with well-composted leaf mulch – this will come in handy if you are growing you’re Chelone is growing in a sunnier spot. 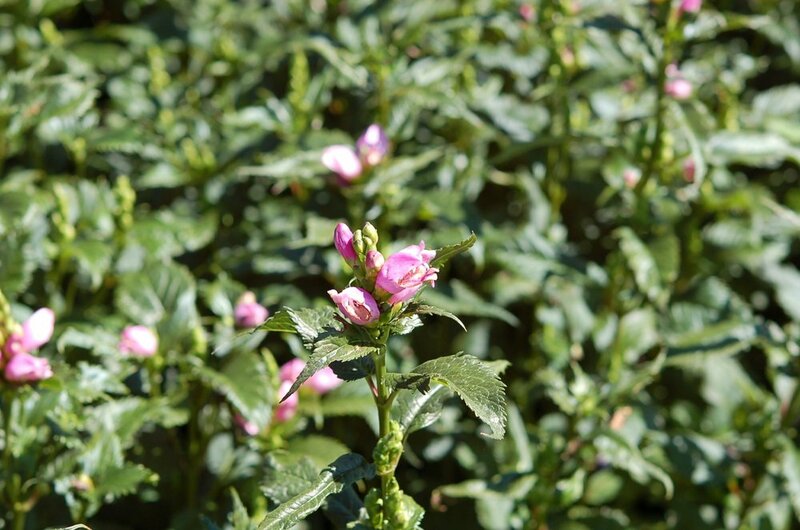 If you are decide to plant your turtlehead in a full shade area, keep in mind that your plant is more likely to need staking for support due to its build and mature height – however if planted in optimum conditions, staking will not be needed. Chelone spreads by slowly sending out rhizomes that will form large clumps – it is not considered to be invasive but it will self-seed in moist soils. It can be propagated by division, cuttings and by seed. Chelone isn’t badly susceptible to most insects or diseases. It can succumb to mildew if it’s grown in soils that are kept mostly dry or if the air circulation in the surrounding area is poor – but when planted in its optimum environment Chelone can be an incredibly successful plant. It makes a great addition to shade and woodland gardens as well as bog gardens or surrounding a shaded pond. It can be used as a border plant and will make a fantastically interesting cut flower. When the weather grows colder and the bright colors of summer being to disappear, Chelone blossoms will pop and bring life back to your late season landscape. As we inch closer to the fall and the hot summer heat turns into a cool autumn breeze, all eyes gaze upon the trees in anticipation for their bright seasonal color show. When the bright blossom colors of summer begin to fade and plants begin their transition into dormancy, the trees push out one last seasonal spectacular burst of color before their leaves drop. There’s no question that people everywhere admire the fall for this beautiful transformation, but why and how does it happen? 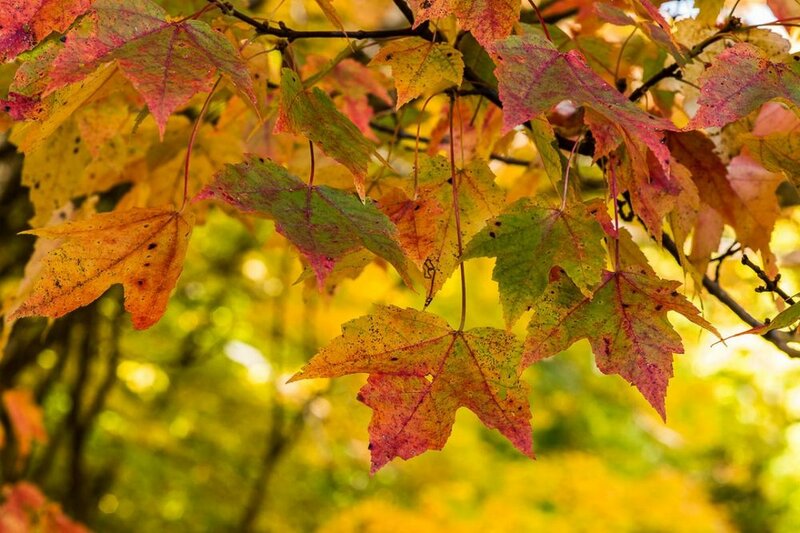 The science behind the colorful changing leaves of fall is actually quite remarkable. During the growing season, the leaves act essentially as a small factory; this is where the nutrients essential to a tree’s growth are manufactured. The cells within each leave contain chlorophyll, which gives the leaf its green color. Chlorophyll absorbs the energy from the sunlight that is used to transform carbon dioxide and water into carbohydrates like sugars and starch. Aside from the green pigment in the foliage, there are also yellow to orange pigments (carotenes and xanthophyll pigments) that are overpowered by the green coloring during the growing season. These pigments, for example, are what make carrots orange. When fall arrives it brings with it shorter days and cooler temperatures causing the leaves to stop making food for the trees as they prepare for dormancy. As a result, the chlorophyll begins to break down and the amount of green color deteriorates leaving the yellow to orange pigments free to shine. But not all trees are coated with the same dazzling colored foliage and that is because there is a miniature art class that’s taking place within the leaves! 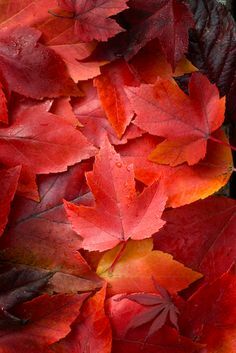 As the chlorophyll breaks down, red anthocyanin pigments are developed which create the beautiful reds and purples. The pigments mix and mash to create that brilliant array of autumn tones. Some mixtures create the red and purple colors seen on dogwoods and sumacs while other mixtures cause the sugar maple to adorn that beautiful orange. Other trees will show mostly yellow leaves while still others, like oak trees, will show mostly browns. This varying color pallet is all due to the pigments mixing together in different amounts. Weather also can affect the intensity of the fall foliage colors. Factors like temperature, light and water supply can impact the degree and duration of the fall color show. Low temperatures that are above freezing will aid in anthocyanin formation, creating the bright reds more commonly seen in maples. However this bright red color could be weakened by an early frost. A significant number of rainy or overcast days could increase the brightness of the leaf color. The best time to observe this incredibly beautiful transformation is on a clear, dry and cool (not freezing) autumn day – make sure to seize the moment because before you know it, those colors will fade as well with a chilly breeze whispering, “winter is coming”. Quite recently a new outdoor trend has experienced a surge in popularity – garden labyrinths. In reality, outdoor labyrinths are not a new trend at all; they have been created all over the world for centuries. 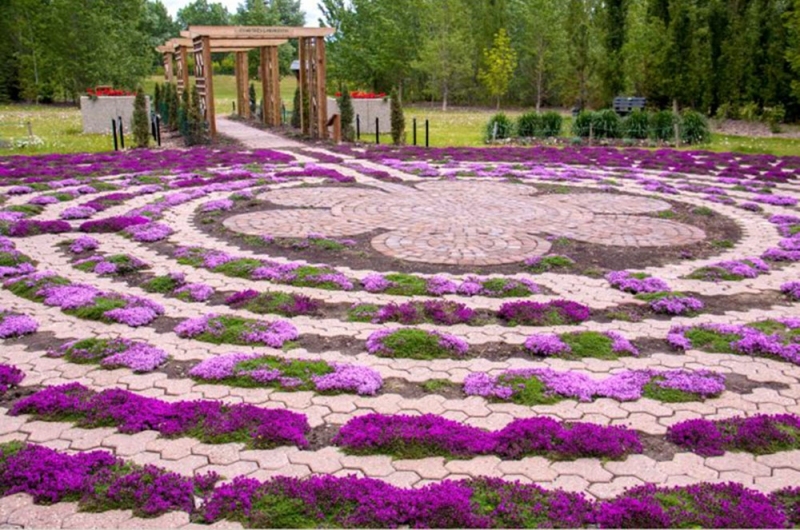 A garden labyrinth is an intricately designed maze that is giving landscape design a new spin. These unique and beautiful structures are designed in a wide variety of shapes and out of an endless range of materials. They are viewed as a meditation aid providing a relaxed, calm, serene feeling to anyone who enters. A labyrinth differs from a maze in that the intent is not to journey through but to. They are made up of a singular curving pathway leading to a central area meant for meditation and reflection – the walker proceeds along the path as a walking meditation and upon reaching the center, they pause, turn around, and walk back out. These wondrous designs have been around for thousands of years and are used in a number of different fashions ranging from ceremonial purposes to choreographed dances. Studies were done by Dr. Herbert Benson at the Harvard Medical Schools’ Mind/Body Medical Institute on the effects and benefits of labyrinths on the human mind. These studies showed that “focused walking meditations are highly efficient at reducing anxiety” and that the effects hold significant long-term health benefits. Walking through a labyrinth can lower your blood pressure and breathing rates, it can reduce incidents of chronic pain and insomnia and aid in improving fertility among a number of other benefits. Labyrinths have been installed in hospitals, health care facilities and spas across the globe because of the amazing health benefits they hold. 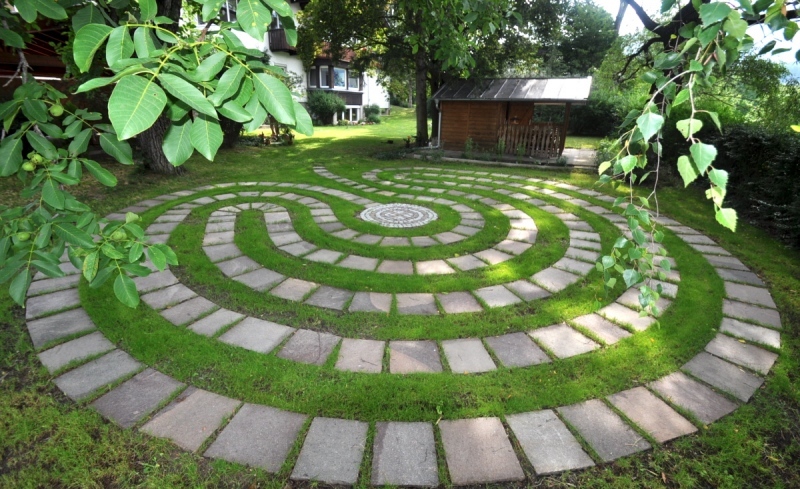 It is said that the garden labyrinth can become a metaphor for the journey of life: we are all on our own individual singular path through life, full of twists and turns, and just like each person’s individual life, every experience and every moment is different from person to person. Labyrinths represent ones’ journey inward to discover ones true self and then the journey back into the everyday world. Walking a labyrinth is a right brain activity – it triggers creativity, intuition and imagination. It can be your own personal tool to clear your mind, release anxiety, aid in transitional periods or provide healing and self-knowledge. Garden labyrinths are becoming increasingly popular throughout the world and their styles can be as simple as using a rope to outline the path or as intricate as using detailed stonework and pavers to create the delicate symbol. Labyrinth designs, paver kits, stencils and pre-made pathways can be ordered online or DIY tutorials are readily available as well. Hardscaping ones property normally consists of the usual yet ever popular items: retaining walls, patios, outdoor kitchens or fire pits…why not stand out from the crowd and add a hardscape feature to your property that is truly unique. Building an outdoor labyrinth into your landscape will not only make your property one of a kind, but it will give you a one of a kind experience with every walk you take. Have you ever seen something so beautiful that it literally begged you to stop what you were doing and stare in awe? The Tigridia pavonia is one of those breathtaking flowers that you can’t help but stare at. Known more commonly as the Tiger Flower, it truly is a wonder to behold in a late summer garden. With similarities to the Daylily and Gladiolus, the tiger lily comes in a vast range of colors that can make your jaw drop. With brightly colored blossoms sitting atop a slender stem, the Tigridia pavonia can produce several flowers per stalk. The flowers are two-toned with combinations of pink, white, red, orchid yellow or orange and a unique contrasting center point. The flowers can be 3 to 6 inches wide and consist of three large one-color petals surrounding 3 small spotted petals. These smaller petals surround a similarly patterned center cup. The stems are surrounded by sword-shaped leaves that stand upright similar to that of Gladiolus. The interesting characteristic about these delicate blooms is that that they only bloom for a single day. However, since the Tiger Flower produces multiple blossoms per stalk, the flowering period technically can last up to several weeks. You can also cut back the first flowers about six inches down the stem to aid them in re-blooming. Tigridia will thrive in areas with well-drained soil and full sun. It has been known to tolerate part shade in a hot climate area. Once established, the Tiger Flower is drought tolerant and deer resistant. It can be used in the landscape as a border or a massing plant; you can also put them in containers as an exotic accent piece. The stems are delicate and the foliage is light so planting it among low-growing plants or groundcovers will work the best. The bulbs should be planted in the spring and it’s recommended to plant 3 bulbs to a group for that extra impact. When planting these bulbs, set them 3 inches into the soil and about 5 inches apart – make sure to water well throughout the season. For such an astonishing plant, they are incredibly easy to grow! The bulbs do produce offsets and will eventually form a large clump. You can divide them every 3 years or so to keep them maintained. The beauty of this flower is enough to make your heart skip a beat, seeing it in bloom is like falling in love at first sight. For a plant as beautiful as this, its hard to believe that it’s so simple to grow and virtually maintenance free! Turn your already beautiful garden in to a showstopper by planting these bulbs next spring. Your garden will surely be the talk of the town, especially during the end of the season after the early and mid season bloomers have faded – the Tiger Flower is absolutely the diamond in the rough! 1. Save your coffee grounds! Believe it or not, coffee is for more than just giving your body a jump-start. Rather than throwing away your coffee grounds, save them for your garden. They are an amazing organic resource and provide nitrogen to your compost as well as assisting in improving your soil structure. 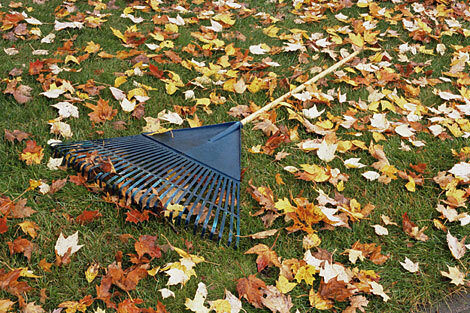 If you are adding your grounds to a compost pile, combine it with equal amounts of leaves and grass clippings. When adding coffee grounds to a static compost bin, combine it with a carbon source (such as shredded paper or dry leaves) in equal amounts. For both composting methods make sure to mix the components together for the best results. If you are adding coffee grounds to your soil, make sure the soil is wet and apply a nitrogen fertilizer simultaneously. Coffee grounds in your soil will encourage microorganism growth. It has also been found that coffee grounds in the soil can also repel pests such as snails and slugs while at the same time attracting earthworms. 2. Save your eggshells! If you place crushed eggshells around your garden plants and vegetables, this will help deter slugs and will take your plants off their lunch menu! There really is no science behind this little hack; it’s simply that slugs do not like sharp edges as their soft bodies could easily be punctured. If you notice the obvious slime trails on your vegetative materials, its time to break out the eggshells (pun intended)! 3. Epsom salt for your tomatoes. Epsom salt has multiple health and beauty benefits for us, but who knew that it could be useful in the garden? Epsom salt is actually a naturally occurring mix of sulfate and magnesium. So when adding Epsom salt, in small quantities, to your tomatoes, can actually help the plant develop better fruit! Magnesium and sulfate are important ingredients when it comes to plant growth. It has also been found that adding Epsom salt around stressed plants can actually help them to recover. 4. Aluminum foil comes in handy! Every gardener is concerned about crawling pests when it comes to their vegetable gardens. Simply wrap a collar of aluminum foil around your tomatoes or squash – this will help deter these pests and prevent them from tasting your vegies before you even get the chance. Again, there is no science behind this hack; most crawling insects are not fond of moving across metal surfaces. The foil also acts as a physical barrier, preventing stem-harming pests such as borers from attacking your plants. 5. Baking soda is a multipurpose product! Baking soda can also be used in the garden as an organic fix for fungal diseases. The sodium bicarbonate properties in baking soda actually act as a natural fungicide. All you need to do is take 1 teaspoon of baking soda and dissolve it in 4 cups of water, add a few drops of liquid dish soap (so the solution can stick to the plants). Spray this solution on plants to prevent fungal diseases like powdery mildew, rust and black spot. This method can be repeated ever week to two weeks (or after rainfall). There are so many garden hacks out there that can make your gardening experience easier and your garden happier. These hacks are heard mostly by word of mouth, so if you have any hacks of your own, please share them on our Facebook. We can all benefit from anything and everything that will make our lives better and easier. Happy gardening!